Tamoxifen is a drug used to treat breast tumours that are sensitive to the hormone oestrogen. The drug molecule binds to the oestrogen receptors on the surface of the tumour cells, blocking them up and preventing the hormone getting into the receptor. Starved of oestrogen, the cancer cells divide less often and become more susceptible to being killed by the body’s immune system. Tamoxifen has been the standard treatment for women with oestrogen-receptor-positive breast cancer for some time and still the best hormonal treatment for women before they go through the menopause. Since 2000 it has been given to women who have been successfully treated for breast cancer to prevent recurrences that occur when stray cancer cells left behind grow to form new tumours. Women identified as being at particularly high risk of breast cancer because they may have a history of benign breast lumps or a gene that makes them likely to develop breast cancer can now be given tamoxifen as a purely preventive treatment. Tamoxifen is a good example of how medical research can sometimes stumble on something good even when researchers are not actually looking. 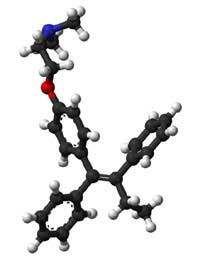 This molecule was originally thought to be a good candidate for a morning after contraceptive pill. Scientists in the USA experimented with it in the late 1950s and then Arthur Walpole from ICI filed a patent for it in 1962. There was not really very much interest in Tamoxifen at the time and the patent application was rejected repeatedly. It was finally accepted in the 1980s, for reasons that will become clear. Further research on tamoxifen led to its dismissal as a contraceptive and it was approved as a drug useful to treat infertility in the USA. Nobody at the time thought of tamoxifen as being potentially useful in breast cancer because it had not yet been discovered that many breast cancers are oestrogen dependent. Doctors had not noticed that this type of tumour grew much faster when in the presence of oestrogen. But Arthur Walpole was not a man to give up and somehow managed to get tamoxifen tested in a trial of women with advanced breast cancer in the early 1970s. It seemed to work quite well but ICI was keen to drop the drug, not realising its potential. Arthur Walpole kept up the pressure and the drug was eventually made available as a treatment for very late stage breast tumours in late 1977. Because the patients taking the drug were so very ill, its benefits were minimal and the drug failed to impress anyone. At the start of the 1980s, tamoxifen was used in a trial of patients with early stage breast cancer, in combination with chemotherapy. There were signs that tamoxifen was increasing survival but the results were patchy. We now know that the trials included women with oestrogen-dependent tumours and tumours that did not respond to oestrogen, so making the results difficult to interpret. The one good thing that was recognised was that tamoxifen had very few side effects – so if it did work it would be highly preferable to toxic chemotherapy. More trials included tamoxifen and finally, in 1998, a major study of the many trials that had been published concluded that tamoxifen was saving many lives and was a major treatment breakthrough for women with early stage breast cancer. More recent studies have now demonstrated the benefits of tamoxifen beyond all doubt. If women who have been treated for early stage breast cancer that expressed oestrogen receptors are given tamoxifen for five years, their risk of their cancer coming back after treatment is reduced by 40%. Over 30% of women treated in this way survive for a significantly longer time. A very large study of all the studies on tamoxifen that had ever been published was completed in 2005. This showed that the death rate from breast cancer in women with oestrogen-receptor positive tumours could be reduced by 50% if women were given an anthracycline-based chemotherapy followed by 5 years of tamoxifen treatment. It seems to improve the proportion of women with breast cancer who survive more than ten years and may have benefits long beyond that. Only time will tell and long-scale clinical trials continue to produce new data. Sadly, Arthur Walpole did not live to see the massive success of tamoxifen and the number of women’s lives that it saved as he died suddenly in the summer of 1977.